Kopan monastery is a beautiful and life changing place to be in. Kopan monastery is a Tibetan Buddhist monastery near Boudhanath, which derives its name from the Kopan hill it is situated on. 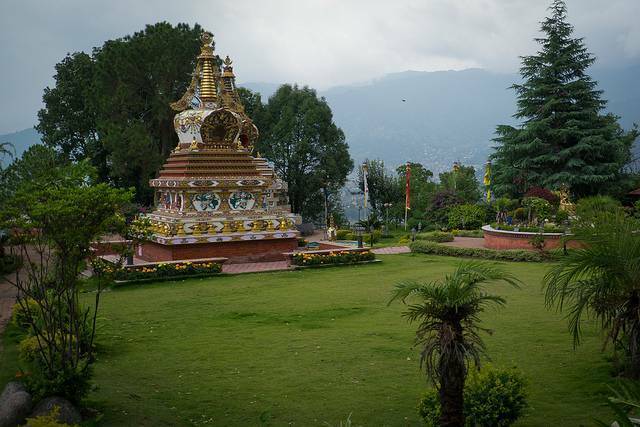 The monastery is situated in an attractive landscape and gives a breathtaking view of entire Kathmandu and Boudnath area. Not only this, sunrises and sunsets are a must watch here giving gorgeous hues of colour in the sky. Kopan started as a small structure with a lot of big love in it. The founders, Lama Thubten Yeshe and Lama Zopa Rinpoche wanted Kopan to be the place which produces good human beings, righteous individuals who understand the complexities of life and yet wish to attend every problem with compassion and tenderness. What started as an honorable idea today houses approximately 365 monks and 360 nuns, each an embodiment of Buddha and his teachings. Kopan is the perfect place for travellers seeking peace or the ones willing to track down the voice of their souls or when you simply want to get away from the city and seep in some nature. Kopan monastery offers many courses for the western foreigner’s coming from all around the world to learn meditation. The courses are of various durations and one can choose whatever suits him / her best. Staying in a monastery and meditating is not everyone’s cup of tea. It might seem easy but it requires lot of mental and physical strength with commitment. Kopan has meditation and Buddhism courses for almost a month each year which is highly recommended for lengthy stays. An entire time table will be assigned to you consisting of meditation hours, lessons to be learnt, and meal hours. During the free time one may have a healthy discussion with fellow global batch mates. It’s a diverse culture here. You will be witnessing some beautiful ceremonies which are close for other visitors. The best past being that they might just let you photograph the ceremonies of the inside of the monastery which is otherwise a big NO NO. Don’t get worked up on the strict rules regarding food. If you can’t resist your hunger pangs, you can go digging the banana pancakes, cakes, coffee, momos that are offered in the nearby café’s. There is so much to be done and learnt and nothing to lose. The Lama’s let you live their life, explaining their beliefs, food habits and personal insight on what keeps the devotion alive. Kopan monastery is easily accessible by Taxi from almost every point in Kathmandu including the airport. An easy trail leads a way up to the monastery in case you’d like to walk.